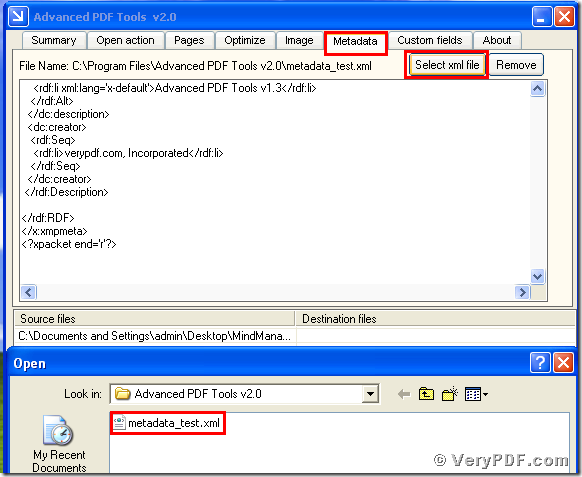 ← Rotate specified pdf pages using command line? Today I am going to demonstrate how to add pdf descriptions via XML files. If you have the same question, please follow me. Have you ever know we can add pdf descriptions via XML files? 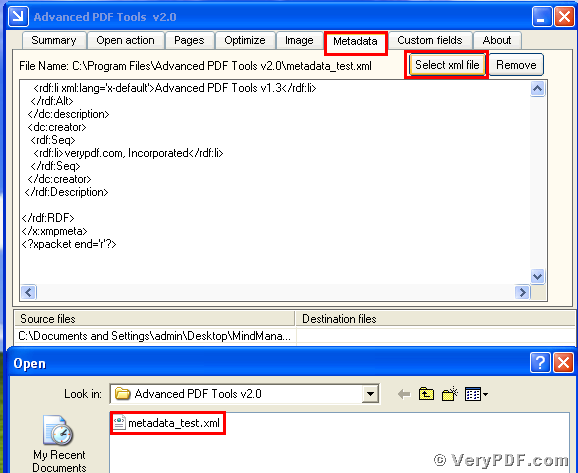 If you want to add more information for your pdf files, you need to add pdf descriptions via XML files. So you maybe do not know what is XML file. At first, I will explain it. XML file (Extensible Markup Language) data file that uses tags to define objects and object attributes; formatted much like an.HTML document, but uses custom tags to define objects and the data within each object; can be thought of as a text-based database. XML files have become a standard way of storing and transferring data between programs and over the Internet. Because they are formatted as text documents, they can be edited by a basic text editor. So how to add pdf descriptions via XML files? And what kind of software we will use in this process? I will point four steps to do it. Do remember to extract it after the download is finished, for it is zipped package. Then unpack it. Step 2, install this software procedure in your computer, and remember to register user, because if you do not register, it is just a trial version. Some functions will be disabled. Make sure you had successfully finished the installation. It will appear an icon in your desktop if you store it in this location. Please look this picture. Step 3, double hit the icon of the Advanced PDF Tools, then let this software run, drag your PDF file (Mind Manager_Viewer_Guide.pdf) into this program. You can see the two dialogue boxes, the dialogue 1: Advanced PDF Tools V2.0 . In this dialogue, you need click the label page “Metadata”, and find the “Select xml file”button and hit it. Right now the dialogue 2(the file name is “open”) can appear at this time. Then find the xml file in your computer and save the change. Please look at picture 1. Step 4, separately hit the right-hand key for the before changing pdf file and the after changing pdf file. Then click the “properties”. I also give you screenshot, please look at the picture2 . After viewing the two dialogue boxes, you will obliviously find that we had already used added pdf descriptions via XML files by using the Advanced PDF Tools. You see it is not difficult to master this function, if you are interested in this software, just visit http://www.verypdf.com/wordpress/ . Thanks for your reading. This entry was posted in Advanced PDF Tools and tagged add PDF descriptions, Advanced PDF Tools. Bookmark the permalink.